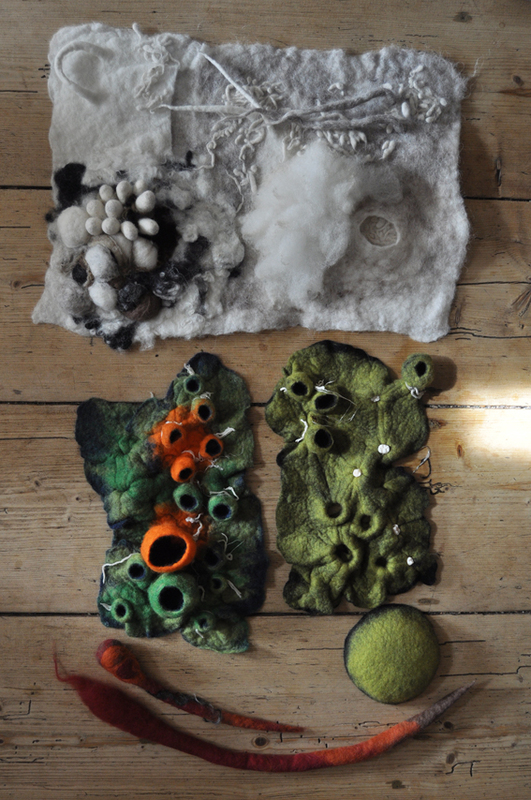 Yesterday Rami completed two great sculptural shibori pieces, both were laid out and felted to the prefelt stage then tied and felted again until they were finished. I’d be happy to call either piece my own especially since one features my FAVOURITE colour combination (some might say obsession), light green and black!!! Today we concentrated on big boy toys. By this I primarily mean electric tools to help hasten the felting process or achieve specific end results easily, obviously we’ve been using the ‘niki & niki’ felting tools daily but I think that goes without saying by now. I really don’t have time to write up each method we used, thanks must definitely go though to Horst for sharing his method of felting using a combination of sander, washing machine and tumble dryer, check out Rami’s sample below to see the soft and tactile end result. We also tried out Horst’s way of utilising a plasterer’s float to felt cords and if you’re interested in the tumble dryer method for nuno felting large pieces ‘Nuno Felting with Chrissie Day and Nicola Brown’ gives step by step instructions! At the moment there are a string of felt beads in the washing machine (another technique, pics later maybe) and I’ve got to rush to write up my submission to ‘Beauty in Nature’ and pack the relevant pieces to deliver to the Crafts Council tomorrow. Rami and I’ll be heading to Borris Market in the morning then visiting Philip at Cushendale Woollen Mill, Alex at Grennan Craft School and then going to Kilkenny where we’ll check out the National Craft Gallery, stroll around the grounds of Kilkenny Castle and in general have a browse and a bite to eat! This entry was posted in Felt, workshops and tagged Felt, felting at Clasheen, felting classes, felting workshops, Horst by Nicola. Bookmark the permalink. Wow! You and Rami certainly are covering a lot of ground in a short amount of time. 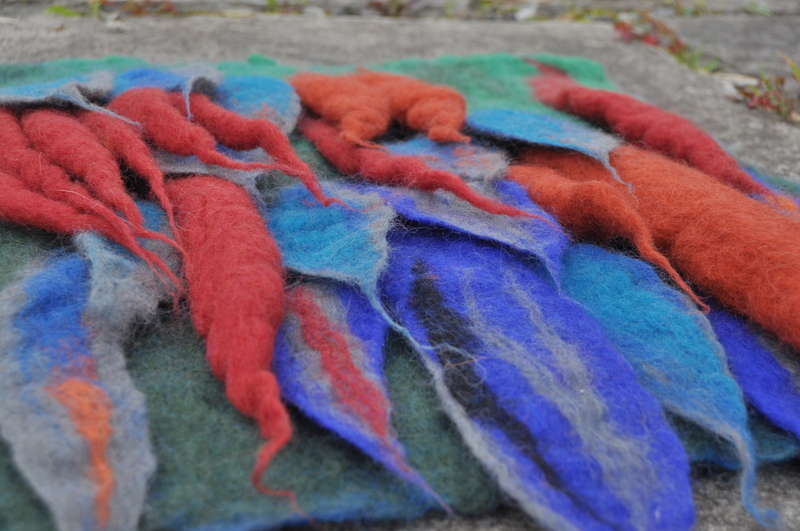 He’ll be well prepared to create all sorts of lovely felted work by the time he heads home. Hi Dorothy, the shapes on the green/black and green/navy/orange piece were created using shibori (plenty of references on the internet, sorry I’ve run out of time now!) and the little crater in the white piece was made felting a plastic resist into the layers and then cutting into the felt to remove it and expose the underneath. Hope this helps! Beautiful pieces that you and Rami have made.